A careful look at the campaign not only shows a great game but also some pretty awesome loot that I would recommend getting now. It is a very generous campaign. In terms of add-ons: Expansions, Play Mats, A Not-So-Much Hardcover Art Book as a Bio and Universe Factoid laden tome much like the old Who’s Who in the Marvel Universe or a pretty little hardcover Capes and Villains Comic Vine for your coffee table, metal dice, and more create-a-art than you can shake a stick at a far lower than most campaign prices. Heck – you can create an entire deck. BAM! POW! BIFF! Cape Up! Loot Up! Pledge Now! *Much like Sentinels the designer has a universe spinning in the background of his game. On the company website the characters have bios and backstories (Ok – some of them need work :))The characters belong to what he calls ‘districts’ – their home turf. Deco City is the mock Gotham, etc. The characters have a little more dimension than the two on the card – they have hideouts, cronies, henchmen etc. There are some big ideas in his head. The game has a mythos of sorts and a lot of potential. It would be fun to be on the ground floor of a growing universe. *What’s the best part of a comic book? Watching Bats eat a tuna sandwich as he mopes away to his personal man-at-hand? Answer: THE MEGA SHOWDOWNS AND ROOFTOP BATTLES!!!! This is what the game is about. The POW, BAM, BIFF of comics. It is a quick frenzy of a game about trying to be last man of iron, woman of heroic go-go boots, or alien deathmonger standing. A toe to toe, cape to cape, showdown. *I know a game play vid is coming, but in talking with the designer, it sounds a bit like King of Tokyo . The dice represent bursts of energy you are using to power the powers on your cards. Quick immediate attacks, preparing a just in case defense, or ‘locking’ away dice to power those ueber-moves on a forthcoming turn. Throwdown Yahtzee in tights! *Each character has a unique deck with unique art and a unique style, some doubles, but not just a single big over-sized character card and generic play cards. You’ll feel like your character as the dice start flying. *This is a game for the Cardboard Kingdom AND the Paneldom. Gamers and Comicheads unite! The comic mash-ups are fun and fully realized. Each pair of cape and villain has their own style that fits well and connects the pair. The mash-ups aren’t spoofy, but fun homages. *Did I mention the ART? I love it! It isn’t just part of a card – it’s part of the game. *The game price is market right. The 4 expansion decks seem fun and varied and as a bundle for $20 – they increase the game by a half. It clocks in between a Munchkin base with a heftier expansion than a foil and Smash-up with an expansion. ‘NUFF SAID! *There are a bunch of kitschy add-ons. T-shirts, dice bags, play mats. Not really my cup of tea – but since the designer is a graphic artist he does have in-house familiarity with these things and they are sure to be quality. * The ART Book I’m not a super fan of these. They are nice and if they tumble into a bundle I pledge I am not going to give them the stink eye, but I don’t seek them out. This Art book is a bit more though. 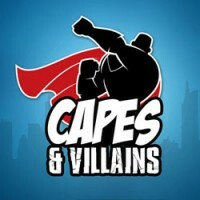 It is more of a Capes & Villain Universe Guide. There’s the character art and bios and background and secrets. It is more like a hard bound Marvel Who’s Who or a Comic Vine for the coffee table. 🙂 That I like – also in the $75 tier you get it with the game and the 4 expansions at a significant discount. That’s a sweet spot for a game and comic fan. I spoke with the designer asking if this was just your mug on a generic template. Nope. These are cards that haven’t been put through the art mill yet so he figured why not give them over to the backers. I asked if I had a ‘Lady Deadpool’ type idea, could I really get that idea conceptualized. The Answer: Sure! I’m going to be MUD HONEY! The Clayface/Sandman/Mystique/Poison Ivy foil to your friendly neighborhood Honey Bee! YAY!!!!!! * That Crazy Pledge That Nobody Ever Pledges Why do people even do them? For 10K if you fly your own bum out to GenCon we will sit awkwardly and eat Chinese food with you for an hour! No Thanks! This one is actually worth it (if you can rob a bank for Capes & Villains .) You help create 20 pieces of ART! You conceptualize your own Hero or Villain Deck (about 15 card arts), an arch-nemesis, a henchman or sidekick, an Agent of Gauntlet, and some civilian schmoe. You get 6 playmats and all the other pledge loot. Sure it’s 1,300 smackers, but you are paying about 60 dollar a pop (far less than a NYCC commishy ) to design your own slice of imagination cake for the game! I’m sure if you ask nicely they’ll even buy you some GenCon pizza if you are there. * No Early Birds but No Promo Left Behind The C&V is trying something new – rather than those Early Birds that can become a can of worms – they are doing Milestone Promos. During various ‘times’ in the campaign (First Day Backer, 50% Funding ) and maybe just off the cuff when they feel like it – they are achievement unlocking various secret promotional cards. If you are a backer at that point – it’s yours FREE! If you miss out on any – they will be available for a tiny add-on fee (or if you want additional sets). It’s a good-natured, low pressure way to encourage pledging. It might not be a super rallying point, but it is kind of fun. It was exciting to get a little update saying ‘Surprise! This is today’s card for hitting the halfway mark! Good job guys!’ It was like a little thank-you for loyalty and hard work. I found it sweet. *The comments section is fun. The designer is a good presence for Q&A and people are friendly and it is sometimes a silly good time. I’ve seen some old faces I know and it is a happy place to say ‘Hi’ and chit chat and get a little hyped up about the campaign. I think it is a game with good potential and a universe that will be fun to play around in. The campaign seems solid without any gimmicks. The developer is friendly and excited about his product. There is a good symbiosis between the developer and the backers. It really seems like a group effort to make the best product they can. Even without those tempting ‘vanity’ pledges, you’ll feel part of the game when all is said and done. *enlarges fist dramatically* Mud Honey gives it a solid (if somewhat squishy) THUMBS UP! So while you are all hopped up on the Cape Juice – don’t delay! CAPE UP AND BE A SUPPORTER HERO!